The biggest hits on the Great White Way are headed to Minneapolis as part of the just-announced Bank of America Broadway on Hennepin 2019-2020 season! 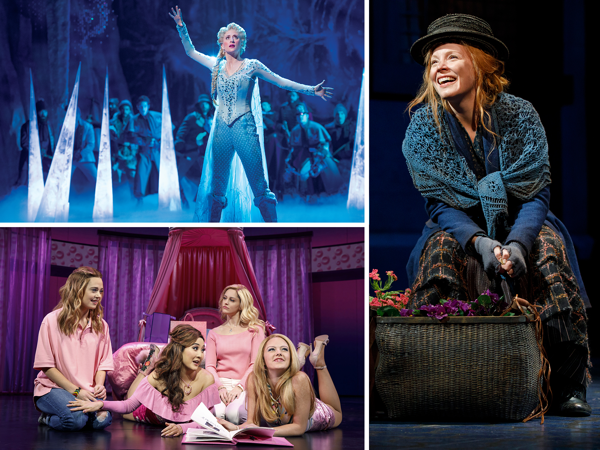 Broadway blockbusters Disney’s Frozen, My Fair Lady and Mean Girls will be part of the upcoming season. The series will also include Anastasia, The Band’s Visit, Come From Away, Jesus Christ Superstar, Summer: The Donna Summer Musical, The Phantom of the Opera, RENT and Blue Man Group. From the Lincoln Center Theater that brought you The King and I and South Pacific, comes “a sumptuous new production of the most perfect musical of all time” (Entertainment Weekly), Lerner & Loewe’s My Fair Lady. Director Bartlett Sher’s glowing production is “thrilling, glorious and better than it ever was” (The New York Times). “Every so often a revival comes along that reminds you how indispensable great theater can be” (NY1). Boasting such classic songs as “I Could Have Danced All Night,” “The Rain in Spain,” “Wouldn’t It Be Loverly” and “On the Street Where You Live,” My Fair Lady tells the story of Eliza Doolittle, a young Cockney flower seller, and Henry Higgins, a linguistics professor who is determined to transform her into his idea of a “proper lady.” But who is really being transformed? A mysterious secret. A family torn apart. As one sister struggles with being an outsider and harnessing her powers within, the other sets out on a thrilling adventure to bring her family together once again. Both are searching for love, but they’ll learn that to find it they’ll have to look inside themselves first. Disney’s Frozen is melting hearts on Broadway in an all-new production created for the stage by an award-winning team. It features the songs you know and love from the original film, plus an expanded score with a dozen new numbers. The creative team at its helm has a cumulative 16 Tony Awards to its credit, including the EGOT-winning composer Robert Lopez, Oscar-winning lyricist Kristen Anderson-Lopez, Oscar-winning writer Jennifer Lee and Tony-winning director Michael Grandage. An unforgettable theatrical experience filled with sensational special effects, stunning sets and costumes, and powerhouse performances, Frozen is everything you want in a musical: It’s moving. It’s spectacular. And above all, it’s pure Broadway joy.